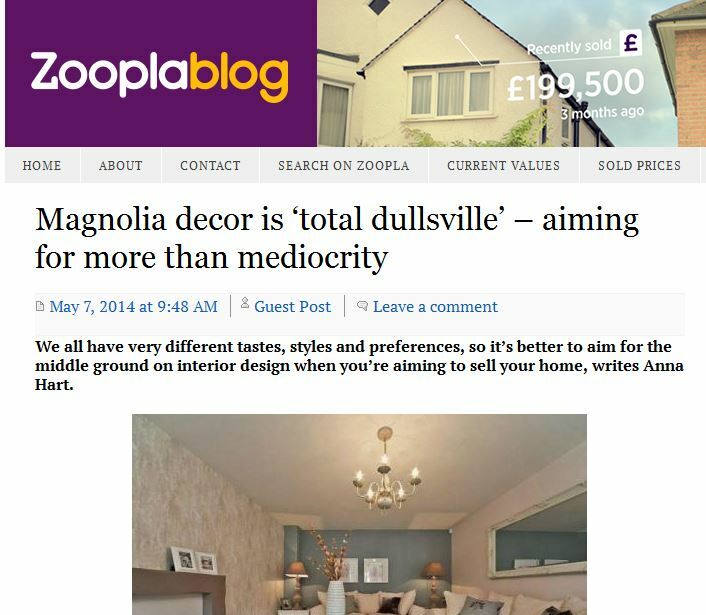 New Zoopla article: magnolia is total dullsville! My latest article for Zoopla is live, and this month I’m talking about decor. The first section of the article is copied below, and you can read the full post on the Zoopla site by clicking on the link at the bottom. We all have very different tastes, styles and preferences, so it’s better to aim for the middle ground on interior design when you’re aiming to sell your home, writes Anna Hart. What one of us considers absolutely gorgeous, the height of style and the veritable bee’s knees, another person may think is hideous, trashy and would never choose it in a million lifetimes. In short, we all love and hate very different things, and you can’t predict your buyers’ tastes. As such, if you’d like a sale at a decent price and within a reasonably short timescale, then I suggest that love is not what you should be aiming for. Why? Because it’s so common for one person to hate what another person loves. Safer all round is to aim for the middle ground. A style that most people wouldn’t get overly excited about, but also is unlikely to be despised. It’s the Switzerland of interior design – yes, I’m talking about neutral décor. But don’t for a second think that I’m going to tell you to paint all your walls magnolia. Magnolia is now such an over-used cliché that instead of portraying a classy neutral vibe, it’s synonymous with basic, studenty, amateur, and value. It gives the impression of not being bothered or able to come up with anything more creative or inspiring. Magnolia is total dullsville, and while it might not be best to aim for love, you certainly don’t want to end up with mediocrity. Click here to find out what my top 5 tips are!